This year’s concert will be distinctly different from the previous five Choral Extravaganzas, when we joined together with three other choirs from different cultural, religious, ethnic origins – Jewish, Christian, Muslim, Hindu, Hungarian, Mandarin and Ukrainian. 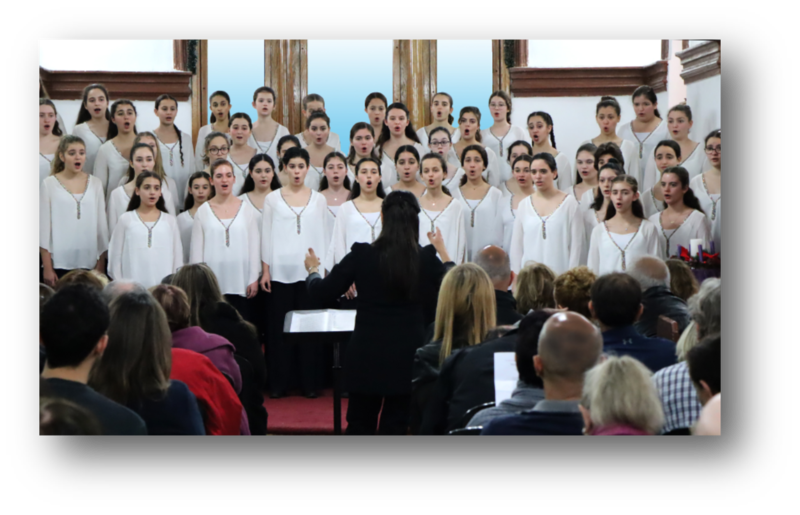 This year will be an exception; for the first time we have just one guest choir: the 44-strong Bat-Kol girls’ choir from Tel Aviv. Bat-Kol, girls’ choir of the Israel Conservatory of Music, Tel Aviv, was founded by Anat Morahg in 1984. They have performed with the Israeli Opera, the Israeli Philharmonic Orchestra and many other orchestras, and in concerts for the general public. The choir’s repertoire includes classical music, Israeli music, and works written especially for Bat-Kol, as well as folk songs and popular music. We promise an exciting and polished performance from singers as young as 12 years old and up to over 80! And, as always, the Grand Finale will get the audience and the two choirs singing together songs we know and love as well as learning the odd song in a foreign language – this time Hebrew! We are very fortunate to have the Bat-Kol choir come specially to perform in our Choral Extravaganza and we hope to see you all there.